I have a hard time with the idea of ethnic foods. I like foods from a lot of places, but I have no particular knowledge of how these people actually cook. I don't get out of the country much, and if I did, I'm sure I'd just learn the local word for vegetarian and otherwise stick to the PBJ in my purse. Because I'm easily frightened of meat. But when I'm searching for a recipe idea on teh interwebs, I'm often thinking of what I have on hand and the types of flavors I want to end up with, and I Google "Asian this" or "Mexican that." I'm big on "Indian vegetable side dish." So I want to label my recipes the same way, so folks can find the flavors they're after, but the reality is, most of the time the only "Mexican" thing about a dish is I make is that it includes corn and avocado, or I'll say something's "Asian" because it has soy sauce. This came up the last time I made cabbage slaw. 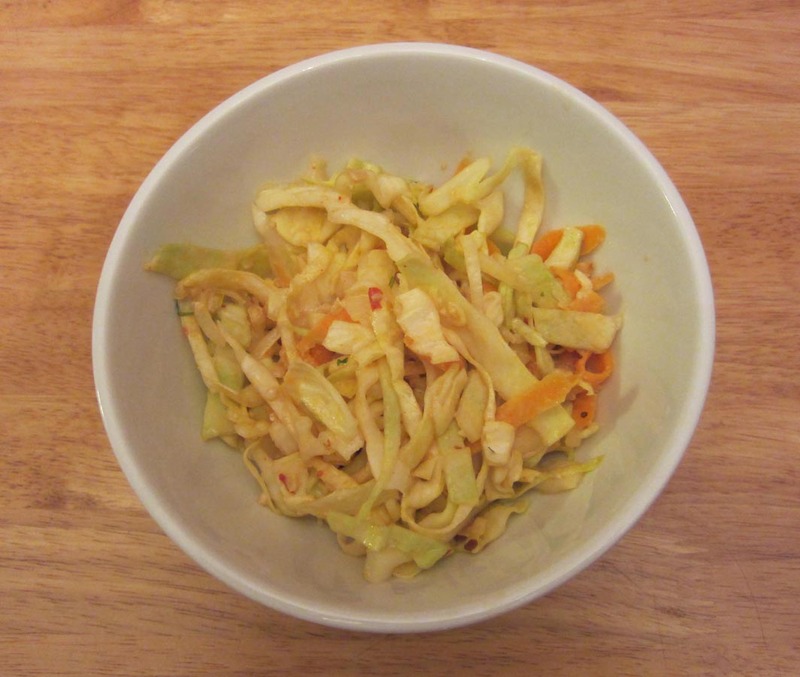 So when I was making up my cooking agenda for the week (hush, it helps), I wrote down "Thai Cabbage Slaw," because I wanted to make a cabbage slaw with peanuts and chilis and lime. But I doubt you're walking into a Thai restaurant and finding this on the menu, and I seriously doubt you'd find it in your grandma's kitchen in Thailand. So here's my vaguely Thai-ish flavored slaw. I started with a head of green cabbage, and this is always a tragedy. 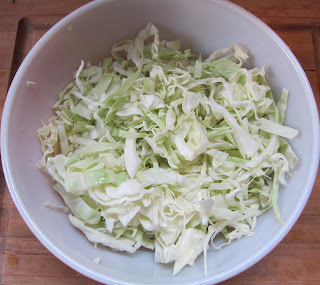 A big bowl of slaw lasts us the week, but only uses about half a head of cabbage...so the other half sits in the fridge (and cabbage does not like to sit once it's cut) and waits for me to have another idea. 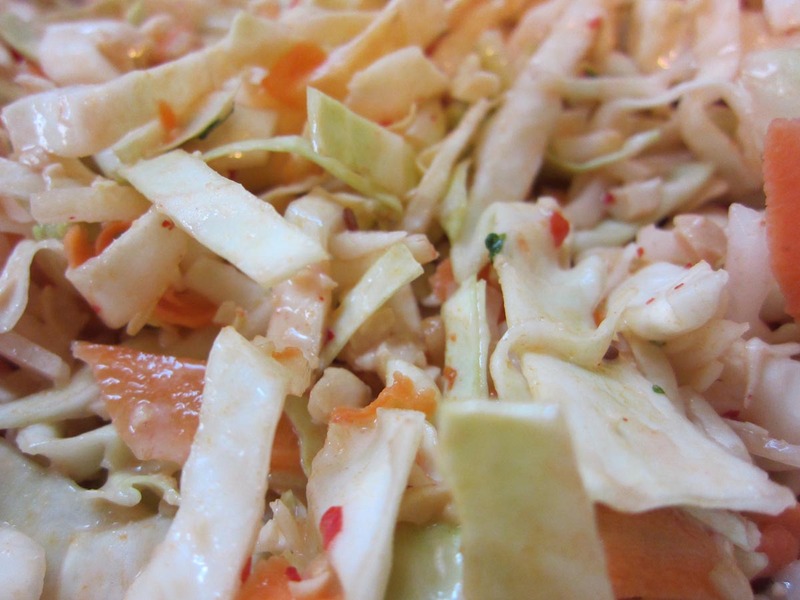 But I don't have another idea, I have a fridge full of slaw. 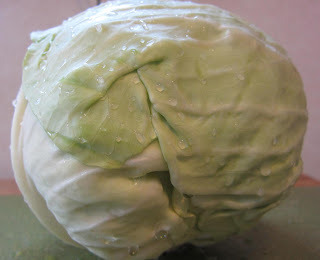 So buy the smallest head of cabbage you can find to reduce waste. Slice it into slaw. If you have a minuscule cabbage, use the whole thing. If you have a standard cabbage, use half. I'd say you should mix it up and use both red and green cabbage, but then you'd have two cut open cabbages in the fridge. 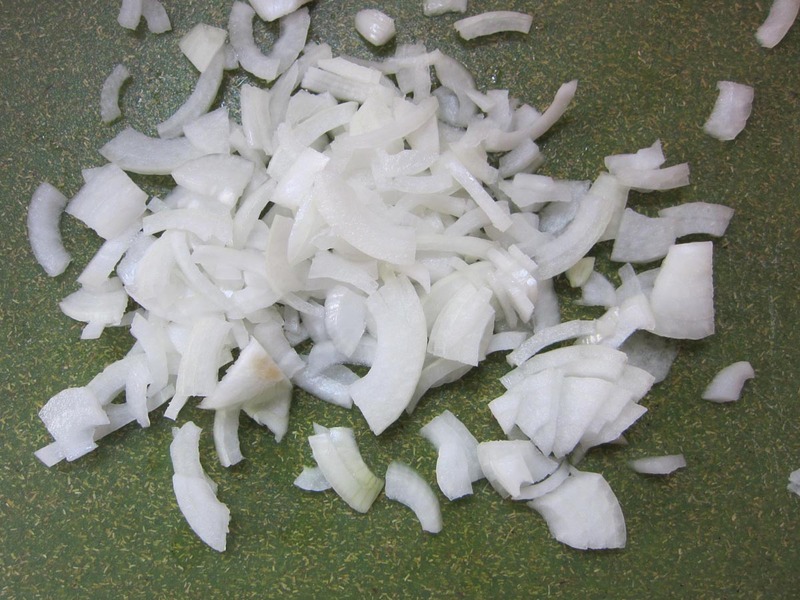 Also onion. I used one small one. 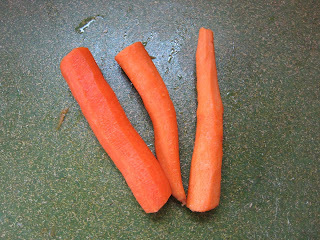 Peeled until I thought I had pulled a muscle in my hand. All into a bowl, and then dressing. I accidentally left honey out of the photo, and the cilantro. Let's have a quick chat about how I tag stuff - you see the fish sauce there, right? I'm still going to mark this vegetarian. I didn't use any of the tamari from the picture, but you could, if you were skipping the fish sauce*. Which you should do if you're making it vegetarian. 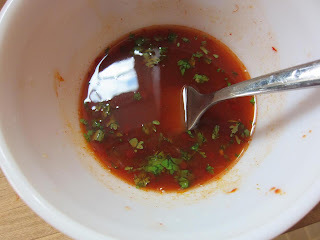 Put together a sauce with chili sauce, the juice of a lime, rice vinegar and your choice, soy or fish sauce, and a bit of honey. Add some cilantro if it's handy. 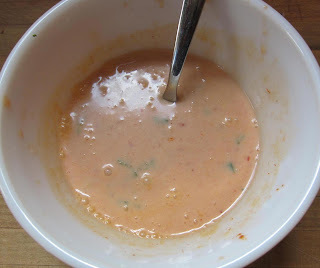 Then make it creamy with yogurt. Taste and adjust. Me, I kept going back to the vinegar. 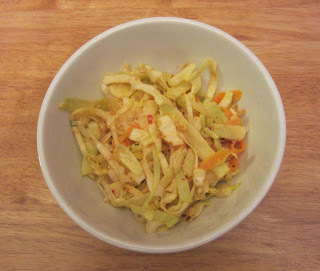 Pour the dressing on top of the slaw, and mix it with two spoons. Mix it very well so everything is coated. Now smash some peanuts. I laid my peanuts out on a kitchen towel. 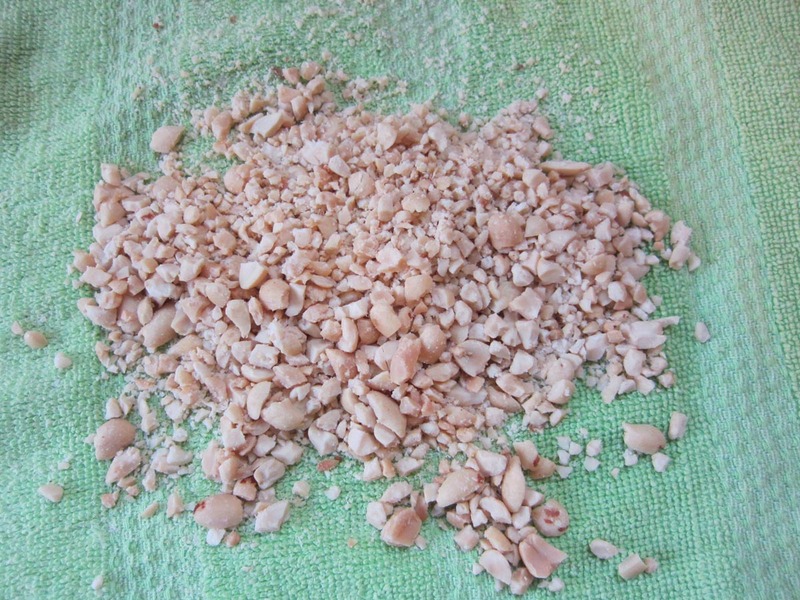 Folded the towel over the nuts, and hit it with a mallet. A lot. 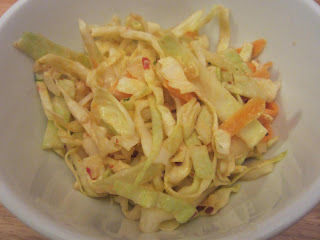 Then tossed that into the slaw. Give it at least half an hour in the fridge to come together. It'll be better after a day. You know what you could do if you didn't hate coconut? Use coconut milk yogurt. Or just coconut milk. Then you're just honey away from making it vegan, and it's got that boost of almost authenticity. I just don't like coconut. 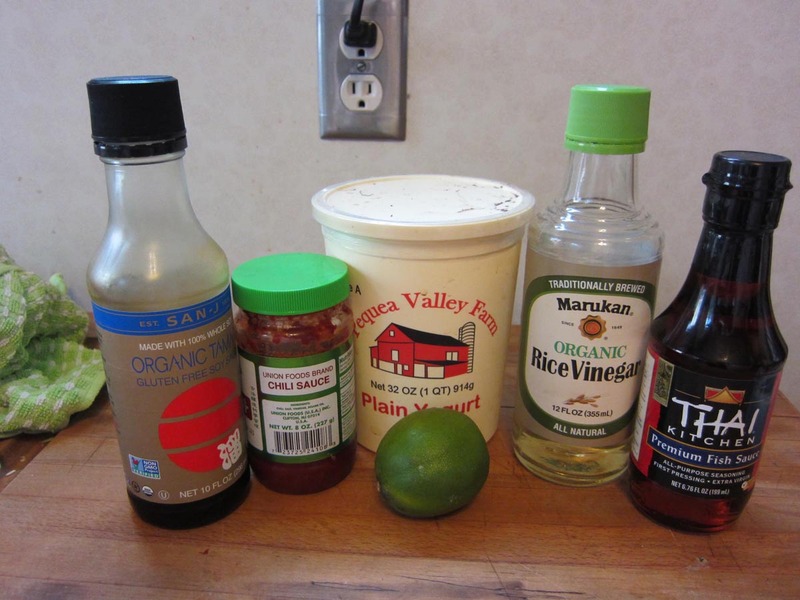 *Fish sauce to soy sauce is not a great substitute, but there's really not that much fish sauce here, so it's not a big loss. 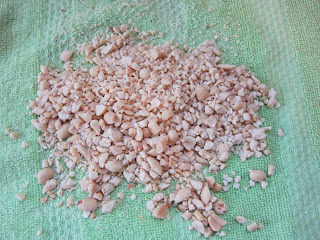 You could use worcestershire (even vegan worcestershire), and some folks say soy plus more salt, and there are other ideas out in the world, but if you were going the simple route, I'd say just do soy, it's easier and no biggie in this dish. Reminiscent of Thai spices and flavors, crisp and cool and spicy and tangy all at once. 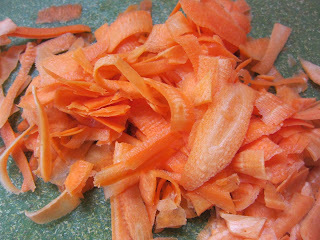 Mix shredded cabbage, carrot peels (no, peel the carrot, toss the peels into your stock bag, and then keep peeling - those peels) and onion in a large bowl.Make dressing of chili sauce, lime, fish sauce or soy, rice vinegar, honey, cilantro (optional) and yogurt.Toss slaw with sauce. 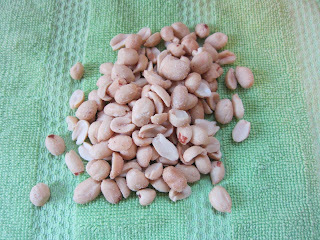 Smash peanuts and stir in well.Let sit fridge to meld for at least half an hour, better overnight.